Well, now that we’ve put to bed another Christmas holiday, it’s important to look back on things that are most important: which, if you’re a fan of Doctor Who, means the yearly Doctor Who Christmas Special. Since 2005, no December 25 has gone by without the BBC airing a new Who episode (though they’ve only aired on Christmas here in the States since 2008); typically, the Christmas specials have served as something of transition between seasons for the series, and sometimes as a thematic preview of the season that is to come. Under Russell Davies’s tenure as show runner, the Christmas specials were generally “event” episodes that were arguably the most high-profile of their year. The original 2005 episode, “The Christmas Invasion,” for instance, served as the beginning of David Tennant’s acclaimed run as the Tenth Doctor, while 2009’s “The End of Time, Part 1,” marked the beginning of the Tenth Doctor’s end (the second part aired on New Year’s a week later). 2006 saw “The Runaway Bride,” a rather comedic episode that guest-starred popular British comedienne Catherine Tate, offering a transition between the Doctor saying goodbye to his former companion and soul mate, Rose Tyler, and his next companion, Martha Jones. “The Voyage of the Damned” in 2007 represented the most publicized and highest rated episode of Doctor Who since its relaunch, as the producers scored the coup of getting pop star Kylie Minogue to play the Doctor’s companion for the episode, which was an incredibly fun outer space pastiche of Titanic and The Poseidon Adventure. Minogue, if you’re not aware, is something of the British Commonwealth’s equivalent of Madonna, if Madonna, like Minogue, had just come back from a very high-profile and successful battle with breast cancer. 2008 was a standalone special, the first of five straight holiday themed specials that built to Tennant’s farewell from the series in the next year’s special. Called “The Next Doctor,” it starred David Morrissey (a name who had been bantered about by Whovians as a potential future Doctor) as someone claiming to be “the Doctor,” whom the audience is intended to believe could be the Doctor’s next incarnation (spoiler – he wasn’t). Other than playing off of the audience knowing that Tennant’s tenure as the Doctor would be ending, this had actually been the weakest of all the specials to date. Basically just a Doctor fights the Cybermen episode with a nice little mystery wrapped around it, “The Next Doctor” also featured a somewhat controversial finale, by Who standards, with a raging, 100 foot Cyberking marching across Victorian London. Traditionally, you have to understand, that whenever a Who episode took place somewhere in Earth’s past, history would remain largely unchanged; with Davies’s creative tenure coming to an end, this episode broke that rule with gusto, leaving it to Stephen Moffat, as the next show runner, to essentially write it out of existence. You really can't celebrate the birth of Jesus without a two-hearted immortal alien time traveler in a bow tie. Or, for the record, nutmeg. 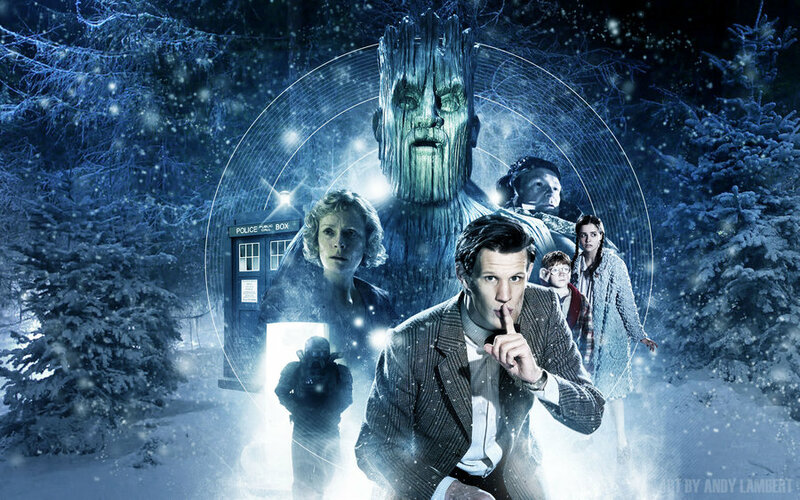 Since Moffat took over as executive producer in 2010, he has clearly changed the way the series has approached the Christmas specials. 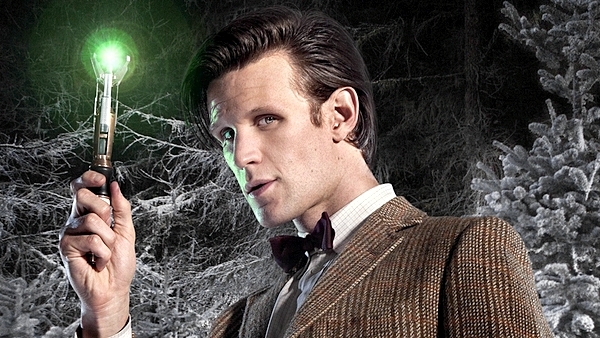 While some of Davies’ specials could sometimes end on a “down” note, Moffat last year went straight for outright sentimentality with the excellent “A Christmas Carol.” Using the Dickens chestnut as its narrative basis, it involved the Eleventh Doctor (Matt Smith) using time travel to change the character of a heartless old miser in time to save Rory and Amy’s Honeymoon space cruise ship from crashing into the surface of a planet. The episode was absolutely brilliant, featuring both the cleverness and emotional resonance that typifies the best of Doctor Who, and might have been Moffat’s best episode after the acclaimed Blink episode from season 3. It did maintain some elements of Davies’ Christmas specials, in that it generally focused entirely on the Doctor and mostly excluded the current companions to marginal roles, as well as dropped some verbal hints about “the silence,” who were the primary villains of last season. 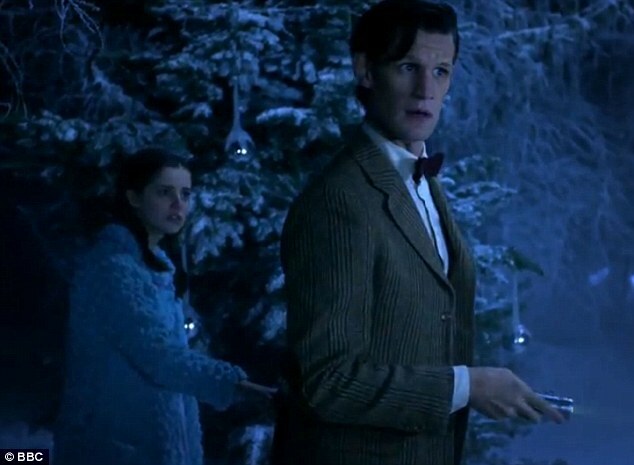 With this year’s special “The Doctor, the Widow, and the Wardrobe,” Moffat seemed to retain the same theme he followed last year, using English popular literature as a basis for his story – in this case the Narnia books of C.S. Lewis, and specifically The Lion, The Witch, and The Wardrobe – and aiming for as much sentimentality as possible. The results this time, however, were rather underwhelming. As the episode opens, the Doctor is escaping an exploding spaceship (modeled rather cleverly after a Star Wars star destroyer), as usual, by the skin of his teeth. In total Moonraker style, the Doctor snatches a protective spacesuit while falling into the Earth’s atmosphere; in total un-Moonraker style, he unfortunately dons the spacesuit with the helmet on backwards. While lying in a smoldering crater within the British countryside in 1938, the Doctor encounters a good-natured, no-nonsense British housewife named Madge Arwell (Claire Skinner), who thinks nothing of the fact that a mysterious space man has crash landed in the middle of a field. Helping the Doctor back to his TARDIS (a sequence which includes a funny bit where the Doctor mistakenly steps a real police box), Madge receives a sign of gratitude from the Time Lord: an offer for her to call on him whenever she needs his help. The Arwells: mother Madge, daughter Lily, and son Cyril. Three years later, the Second World War is underway, and Madge has just been informed that her loving husband Reg, a fighter pilot (Alexander Armstrong), has been reported as killed in action; his plane having gone missing while he was flying home for Christmas. Not wanting to ruin the holiday for her two children, teenage Lily (Holly Earl) and adolescent Cyril (Maurice Cole), she puts off telling them. Traveling to a relative’s home in the country to escape the Blitz, they find that the house’s former caretaker has been replaced by the Doctor, who Madge fails to recognize since he has long since removed the backwards helmet from his head. Despite the Doctor having converted the dreary old mansion into a house of wonders for the children, Madge remains gruff and moody, as she’s still grieving the loss of her husband and dreading the fact she’ll have to break the news to her children. 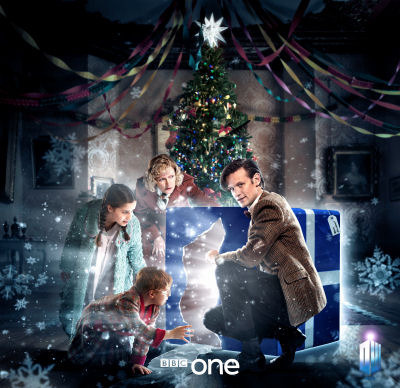 During the following night, Lily and Cyril, unable to sleep, both go wandering around the house; Lily goes and discovers the Doctor tinkering with his “wardrobe,” the TARDIS, while Cyril, meanwhile, goes and investigates a large, mysterious gift box the Doctor placed under the tree. Climbing inside, Cyril gets lost in a world that seems filled with living Christmas trees. 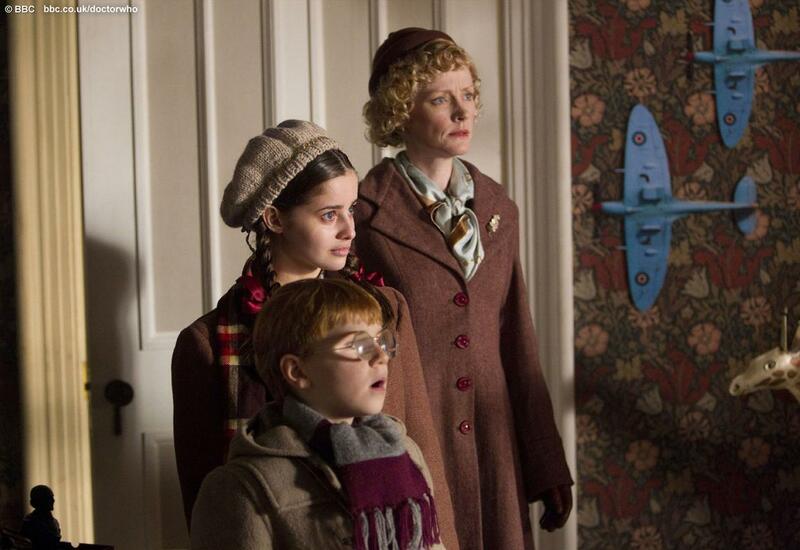 Discovering he’s gone, Lily and the Doctor go in after him, with Madge soon following after. 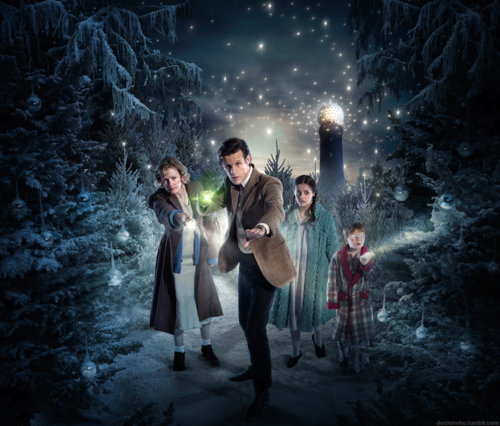 It isn’t long before it’s clear that the magical world is in danger, and it’s up to the Doctor and the Arwells to try to save the planet’s trees before they are destroyed by an intergalactic slash and burn outfit (though in this case, they actually melt trees with acid rain). Lily and the Doctor discover that they're not on Earth anymore. Unfortunately, they're not in Narnia, either. When it comes time to make its landing, the episode does score as a tearjerker, if a predictable one, and it ends with an incredibly touching moment for the Doctor as he visits the Ponds for the first time since the end of last season. All told, though, this was the weakest of the Christmas specials to date. As anyone who has read my recaps of last season can tell, I’m not as hard on Moffat as some people are, but this was certainly the first time I felt that he was completely off his game. Moffat’s weaknesses as a writer were unfortunately quite glaring here, as the entire main plot seemed mechanically contrived with lots of sci-fi gobbledygook and technobabble, aimed at driving home themes without the slightest hint of subtlety. As said, though, there are some nice moments, some good lines, and the ending is touching stuff, so in the end the problem with “The Doctor, the Widow, and the Wardrobe” is not that it’s a bad watch. But given its overall quality, combined with the fact that there didn’t appear to be any major seeds planted for the coming season, this might be the first Doctor Who Christmas special I would label as worthy of being skipped. Posted on December 26, 2011, in The Antiscribe Appraisals (Reviews), The Antiscribe Recaps (Self explanatory, really). Bookmark the permalink. Leave a comment.